Ed Newbold | New Orca print will be 3 ft. wide! New Orca print will be 3 ft. wide! 26 Jul New Orca print will be 3 ft. wide! Posted July 25, updated August 20, 2016 from Seattle, WA. 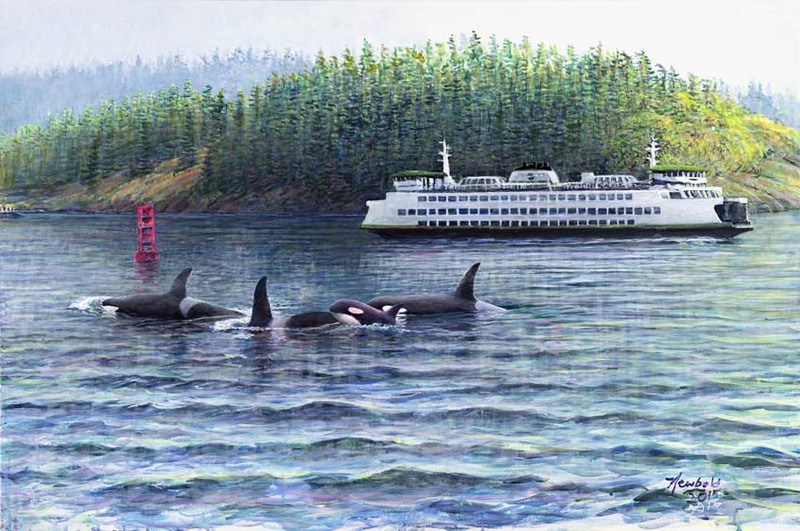 I am so delighted with the last and maybe final incarnation of Orcas in the Salish Sea that I am publishing it at 12” x 36”. The price will be $40. 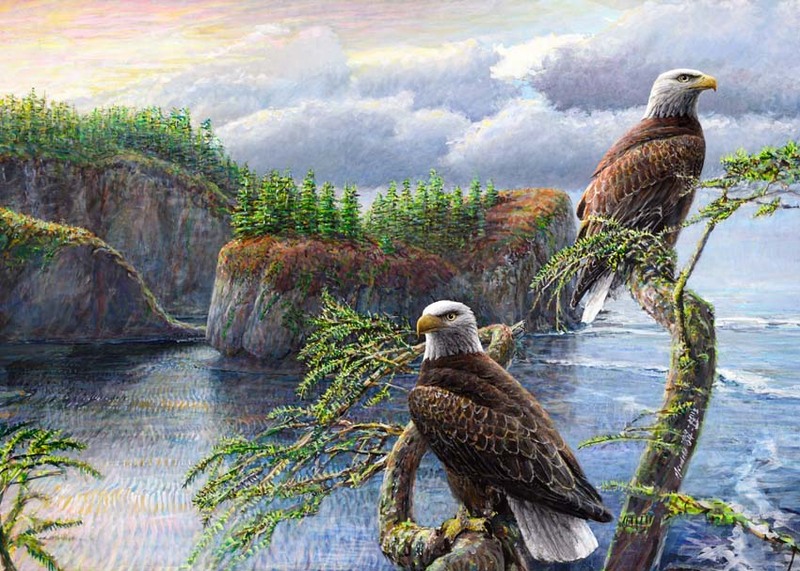 I do not have the capability to either mat it but I can frame it and 12 x 36” is a standard size, someone once assured me. Since the last time I made massive minor changes and added clouds to the sky. Here’s what the 12 x 36, which will have a stock name of Orcas in the Salish XL, not named after the Pipeline. 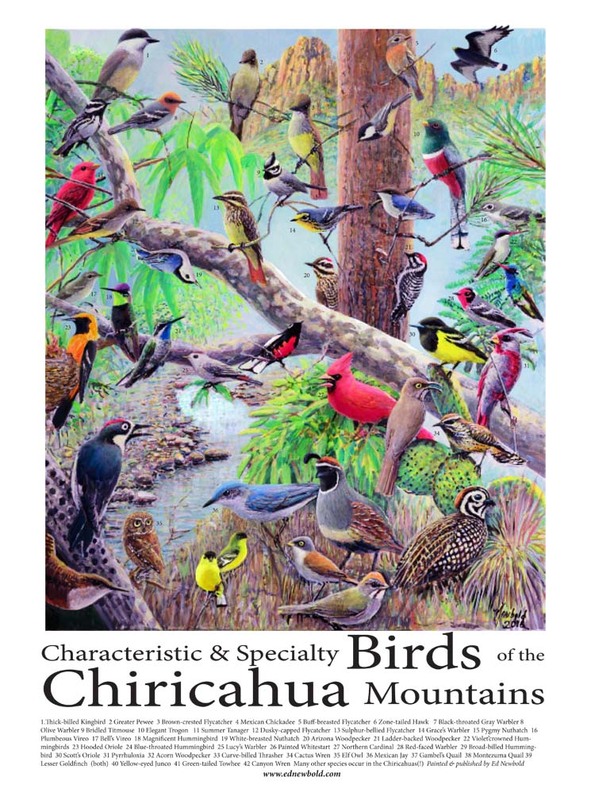 I’ve put a lot of time into the detail work on Birds of the Chiricahuas. That’s going to go on for a while, until I like it. After our recent hike in the Chiricahuas, it pains me to not have White-throated Swift, Hepatic Tanager or Northern Beardless Tyrannulet in that, but you have to draw the line, or paint it, somewhere. Crabs have taken a back seat to these projects but they are not forgotten. 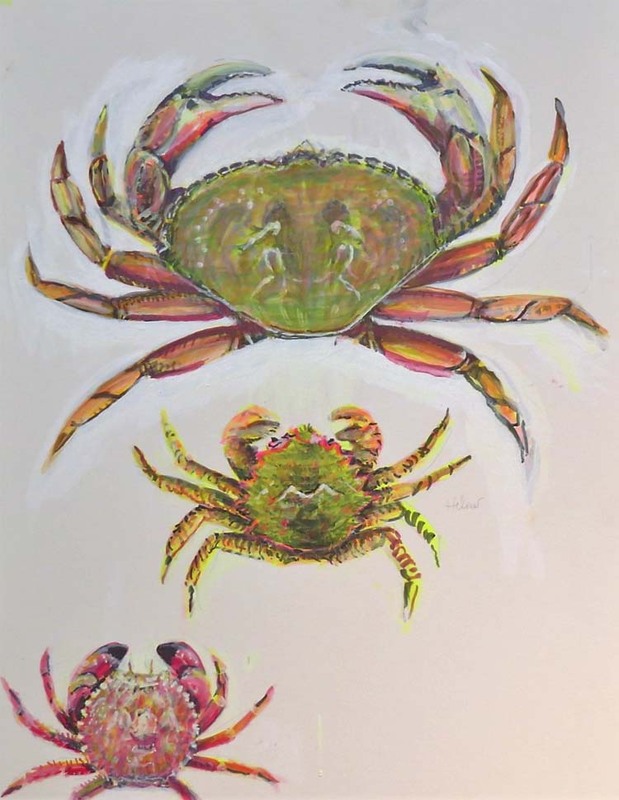 I may reach an intermediate endpoint—maybe I’ll do a poster of just the Cancer Genus Crabs. That would be the lazy man’s way out, painting only 8 crabs instead of 67. Here’s the other project I’m working on. If you guessed those are Eurasian Hedgehogs, well I’m flattered, because truly I have no experience with this critter. 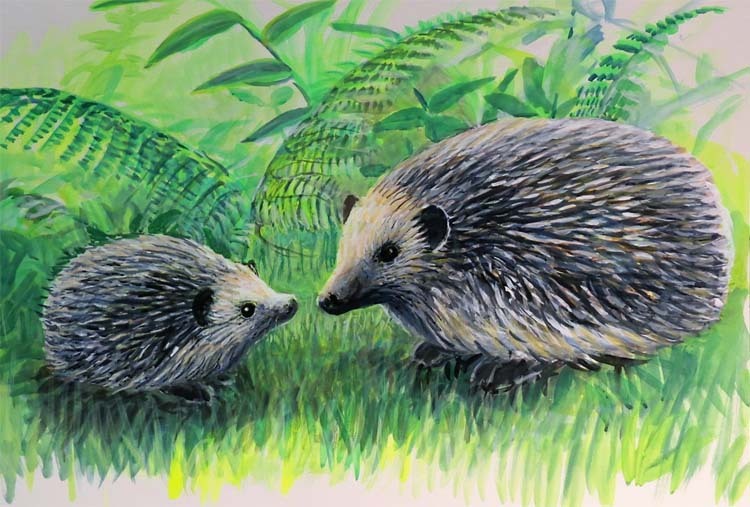 I’ve been asked off and on if I have a Hedgehog painting and always politely said no but thought, “Why in the world would I have a Hedgehog painting?” They aren’t native to the Northwest, and the closest you can find a wild one is England. Now first, I want to explain what defeated all my objections to painting Hedgehogs, then my big concern. A woman who is the mother of three daughters wrote me an email explaining her plight. When each daughter was born, Dad did a wood-carving of an animal for her. The first daughter got a whale. The second daughter a Hedgehog and the third daughter a Hummingbird. The family then found my little store and found that my “Hummingbirds of the US” was a perfect gift for the third daughter. The “Cetaceans of the Eastern Pacific” was a perfect gift for the first daughter. But wait, what about the second daughter? Remember, I was a middle child myself. Is she going to have to grow up permanently traumatized? No! I’ll paint a Hedgehog!!! But now I’m getting worried about the quality. Sure I’ll get something, but my background so far has been lazily painted and I’m worred about the static quality of the composition, the lack of furry feel to the critters, the lack of light in the painting and a host of other issues. I’ll download some more shots of Hedgehogs and see if I can get any clues and I’ll just keep plugging away at and hope I can get an image that conveys in some slight measure what a massive amount of cuteness is involved in being a Hedgehog.